Kubernetes events are objects that provide insight into what is happening inside a cluster, such as what decisions were made by scheduler or why some pods were evicted from the node. You can read more about using events for debugging your application in the Application Introspection and Debugging section. Since events are API objects, they are stored in the apiserver on master. To avoid filling up master’s disk, a retention policy is enforced: events are removed one hour after the last occurrence. To provide longer history and aggregation capabilities, a third party solution should be installed to capture events. 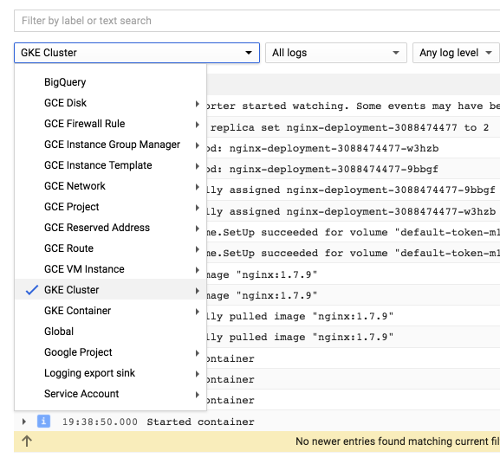 This article describes a solution that exports Kubernetes events to Stackdriver Logging, where they can be processed and analyzed. Note: It is not guaranteed that all events happening in a cluster will be exported to Stackdriver. One possible scenario when events will not be exported is when event exporter is not running (e.g. during restart or upgrade). In most cases it’s fine to use events for purposes like setting up [metrics][sdLogMetrics] and [alerts][sdAlerts], but you should be aware of the potential inaccuracy. In Google Kubernetes Engine, if cloud logging is enabled, event exporter is deployed by default to the clusters with master running version 1.7 and higher. To prevent disturbing your workloads, event exporter does not have resources set and is in the best effort QOS class, which means that it will be the first to be killed in the case of resource starvation. If you want your events to be exported, make sure you have enough resources to facilitate the event exporter pod. This may vary depending on the workload, but on average, approximately 100Mb RAM and 100m CPU is needed. Since event exporter accesses the Kubernetes API, it requires permissions to do so. The following deployment is configured to work with RBAC authorization. It sets up a service account and a cluster role binding to allow event exporter to read events. To make sure that event exporter pod will not be evicted from the node, you can additionally set up resource requests. As mentioned earlier, 100Mb RAM and 100m CPU should be enough.